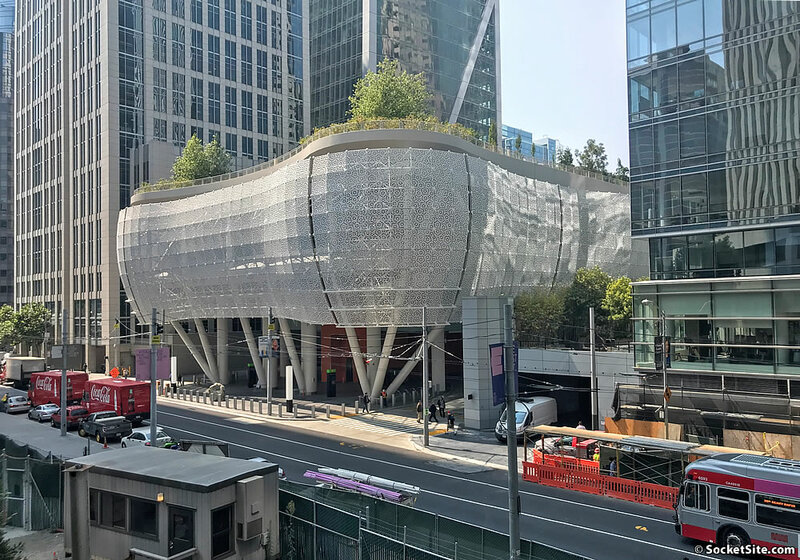 The new Salesforce Transit Center will remain closed through the end of October, at least. While the center’s rooftop park could reopen before the cracked beams which support it are fixed, it won’t reopen before the root cause of the fissures is known. And bus service won’t return to the new transit center until a permanent fix has been engineered and successfully implemented. At the same time, with emergency shoring now in place and slated to be beefed-up, Fremont Street, which has been closed between Mission and Howard, is now expected to reopen by the end of next week. UPDATE: Fremont Street, between Mission and Howard, is now scheduled to reopen on Wednesday, October 17. UPDATE (10/15): While the Transit Center remains closed, Fremont Street, between Mission and Howard, has just reopened. You mean after the inferior rails have been replaced? Kind of ironic, isn’t it: Fremont’s sidewalks are now blocked by support pillars…just like they used to be. To the engineers here, how do the six jacks not cause damage to any of the structure below the jacks (e.g. roadway, train box)? Presumably there is an equal amount of force below the jacks, plus the weight of the jacks. hey, it’s still pretty to look at. i’m sure the raccoons and homeless people are enjoying it immensely. Weld a couple of posts in, call it mannerist tension and move on. For future reference, When a builder announces that that are replacing the exterior glass you look through with cheap ugly stamped metal sheeting to save money, assume that much else will go wrong. This building was an abomination from the get go. as I understood it, the metal-instead-of-glass decision was not, or not solely, a financial one. sadly was something to do with flying shards of glass if a device was detonated. Instead of flying shards of metal? Look around…most buildings are clad in glass. Seems like the safe thing to do would be to have an independent 3rd party inspect all the beams. Get it fixed while it is still under warranty. 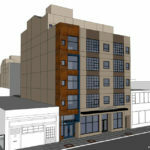 Otherwise 5 years from now – when something collapses and squishes a bunch of people – the City will be on the hook $$$. They’re apparently having the design peer-reviewed, which strikes me as the kind of thing one should do before one builds a billion-dollar structure. A peer review was conducted as part of the original design process for the new transit center as well. Peer review of the design is good – but isn’t that just on paper/ computer? I’m suggesting actually going through and looking at all the structural connections now – in the field. Seems like that would take longer than 3 weeks…. Sure, it obviously needs to be inspected. But there is an open question of whether the design when perfectly executed can stand. This makes me wonder if it will start to sink like the Leaning Tower of San Francisco. Will it even be safe enough to hook up to Caltrain at some point? Actually, from what I read, with the transit center the worry is more about rising than sinking. Apparently it’s like a skyscraper laid on its side, and the weight is spread out enough that they worried parts could rise as the landfill beneath it acts like a liquid. So rather than just sitting on bedrock, its foundation is actually secured to bedrock in a bunch of places so it can’t rise OR sink. I’m not a structural engineer, so forgive me if I didn’t explain this well. They knew at the outset of construction that building a giant concrete tub would become buoyant in the mud and had to be held down, more than propped up. They added anchors to hold it down, plus the weight of the building itself (i.e., the park) also helps hold it down. You realize the beams that sheared are literally visible from the windows of Millenium, right? UPDATE: Fremont Street, between Mission and Howard, is now scheduled to reopen on Wednesday, October 17. The timeline for reopening the Transit Center remains TBD. Note that howard street is also slated to be closed between 3rd and 4th streets from oct 17 to 27 (oracleworld). I’m guessing the october 17 fremont street opening must have been insisted upon so as to avoid a repeat of the chaos due to both streets being closed during dreamforce. Also another night closure of 1st will occur for 1 night sometime next week. With the transbay center reopening still TBD, I wonder how long they can keep the temporary terminal in use without breaking promises (and inviting lawsuits) to the developers who already own the lots the temporary terminal occupies. UPDATE: While the Transit Center remains closed, Fremont Street, between Mission and Howard, has just reopened.